Our Digital Panoramic X-Ray Machine. The lowest possible radiation! We are one of the few dental offices in the Orange, CT area with a digital Panoramic X-ray machine (also called a Panorex). This modern technology scans the entire upper and lower jaw quickly and efficiently, all while exposing you to the lowest possible dose of radiation. 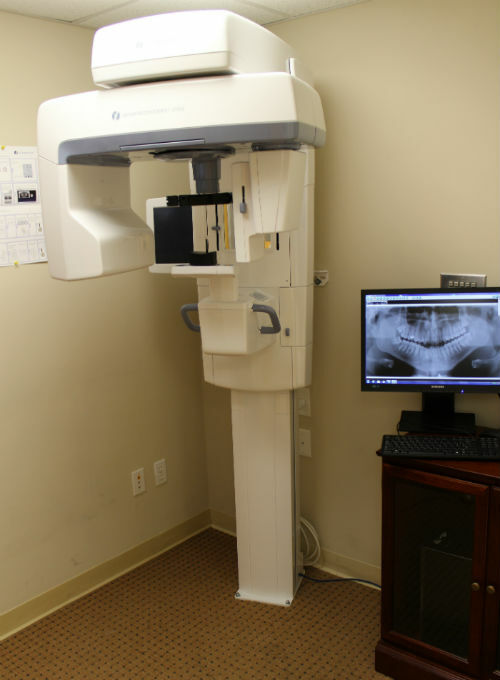 This machine is part of our entire digital radiography solutions which provide Drs. Calcaterra with maximum diagnostic information about your teeth and gums with a minimal amount of radiation. Evaluation of wisdom teeth to allow us to make a recommendation if they should be extracted or retained. To track the development of teeth in our pediatric population to see if there are missing teeth or if orthodontic treatment may be necessary. To detect uncommon but real pathologies such as oral cancer and cysts of the jaw. Evaluation of areas of missing teeth in the treatment planning for dental implants. For routine, annual x-rays in those individuals who gag or who cannot tolerate intra-oral x-rays. Because of the high quality of our machine and the portability of digital x-rays, several dental offices in the area frequently send patients to us to have an x-ray taken. We take the image and send the high quality radiograph back to the dentist electronically.